The below recipe makes about 8 lbs of soap. I used my long wooden mold and a shorter, but longer cardboard mold. In a heat-safe container, add lye to your water, stir, set aside to cool to about 110F. I used a plastic bucket to mix the lye in, and put that bucket in a larger bucket packed with ice water. Worked just fine! In a separate container, melt and combine the base oils. It will completely melt around 160F. When the lye water is cool, pour the lye water into your base oils and blend with a stick blender. After a few pulses with the stick blender, add the madder root powder and the clay. Pulse a few more times to incorporate the powders. Stir in all essential oils by hand. If you use the stick blender, do so with caution! You may accelerate trace. 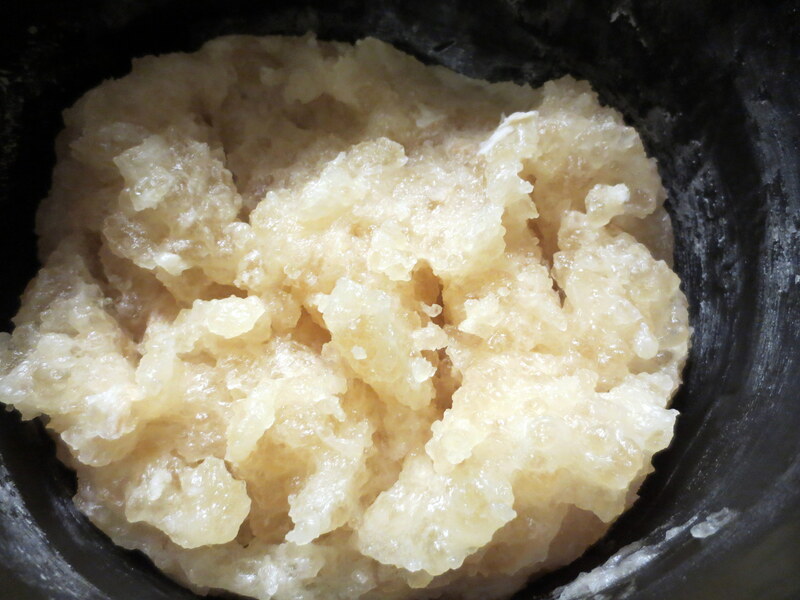 I tried a modified recipe for liquid soap. I doubled the amount of oils, and used a lye calculator to find the amount of lye required. 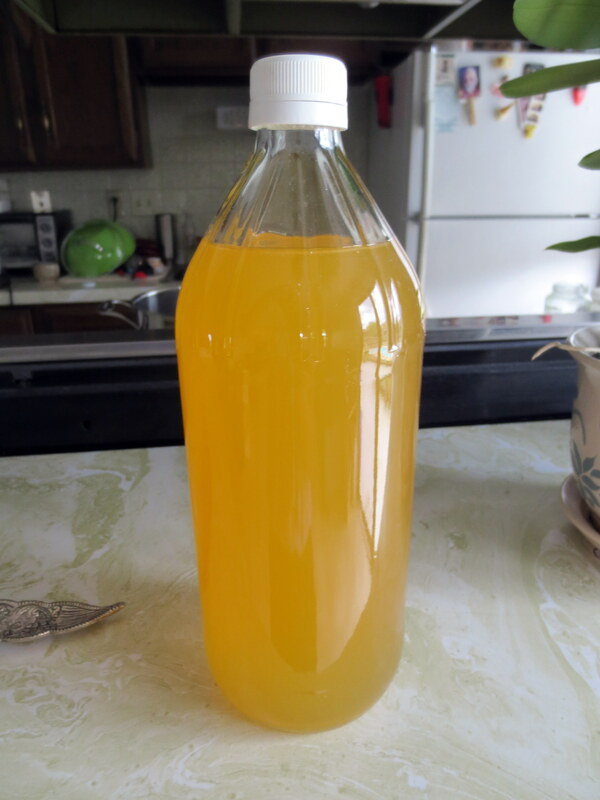 I also found the instructions on this site to be very handy: Learn to Make: Liquid Soap From Scratch. Since I didn’t add extra lye, I didn’t use any neutralizer solution. After a few years of making soap, I had my first-ever lye spill. I’m usually very careful when handling lye, but I guess this time I was not paying attention. On many fronts. I dumped around 10 oz of lye into a beaker of water, and the thing overflowed. Luckily, I was doing this outside and only a little splashed on my arm and leg. I wasn’t wearing gloves! And I forgot to haul out the vinegar jug to neutralize any lye spills! But, I washed it off with water and vinegar almost immediately, and there was no damage done. Don’t follow my example… Wear gloves, add lye to water slowly, and keep some emergency vinegar nearby to neutralize the spill. 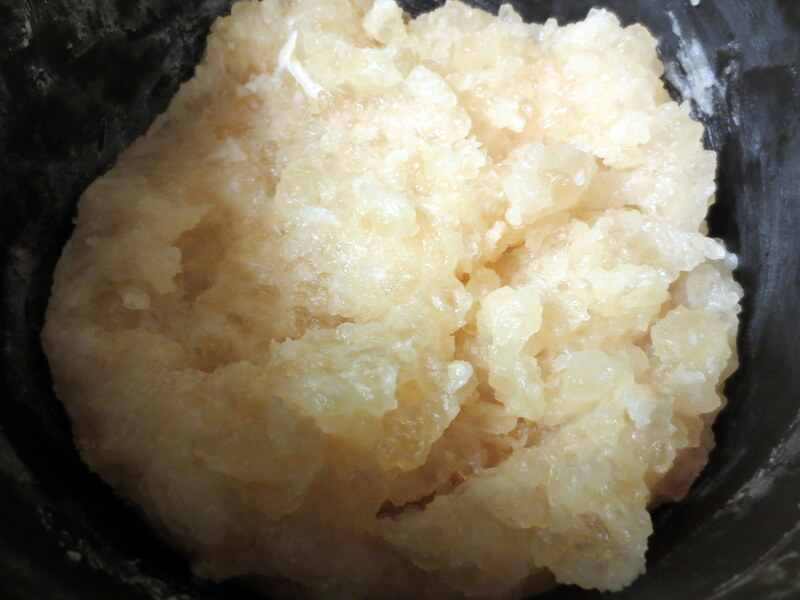 This recipe makes about 6 quarts of liquid soap. Pour the oils in the crock pot and heat them to 160F. The oils should be at about this temperature for the entire process (give or take 20 degrees). Pour the lye into a heat safe container with the water. Make sure you’re in a well ventilated area, and mix well. 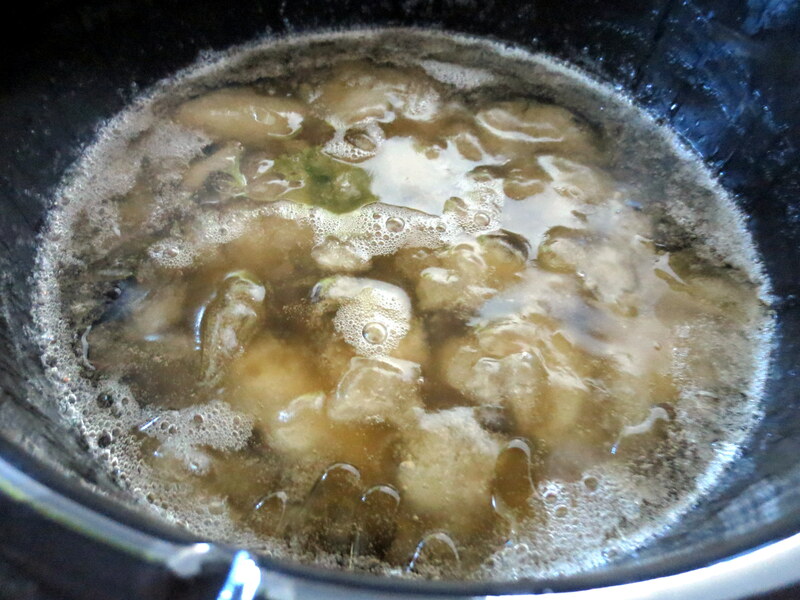 Combine the lye water and oils in the crock pot as soon as the lye is completely mixed (clear solution). No need to wait for it to cool! Stir gently. Pulse with the stick blender until you reach trace. Put the lid on the pot and let the mixture rest for 30 min. If there is any separation, stir for a bit, and replace the lid. Return to the soap every 30 min to stir. The soap will go through lots of stages: “thick applesauce”, “custard”, “mashed potatoes”, “taffy”, “chunky vaseline”, and “translucent vaseline”. Once the soap has softened and turned translucent, check if it has cooked long enough. Combine 2 oz boiling water and 1 oz soap paste. If the mixture is clear or lightly cloudy, you are on track. Otherwise, if it is milky, cook for longer or perhaps there was a mis-measurement. Dilute the paste with the boiling ~90 oz of water. Turn off the heat on the crock pot, replace the lid and go to bed. If there is a layer of soap paste floating on top of your soap, add more water. Be patient and conservative. Once the soap is completely diluted, turn the crock pot on again and bring the mixture to about 180F. Add the essential oils. Some essential oils will cause cloudiness. The overall color of the soap is amber, so adding other colorants should account for this. Let the soap cool. Once cooled, pour it into bottles or jars. Set aside in a cool place. Cure for 1 week. Particulates should settle to the bottom of the jar by the end of the week. Bottle the soaps and enjoy! Here goes my second batch of liquid soap! I am basically following the same recipe as the last time, but I left the crock pot on the high setting for the whole time. I think the reason why the soap took so long last time was because I kept (neurotically) checking the temperature and switching between the low and high settings. Honestly, the precise temperature does not matter – “hot” is enough. The one different thing – I remembered to weigh my crock pot empty this time so diluting the soap paste with water was easier. The empty crock pot weighed 90.65 oz. This recipe is for about 3 quarts of liquid soap. Pour the oils in the crock pot and start to heat them to 160F. The oils should be at about this temperature for the entire process (give or take 20 degrees). Pour the lye into a heat safe container with the water. Make sure you’re in a well ventilated area, and mix well. KOH makes a funny groaning noise as it’s dissolving (normal). 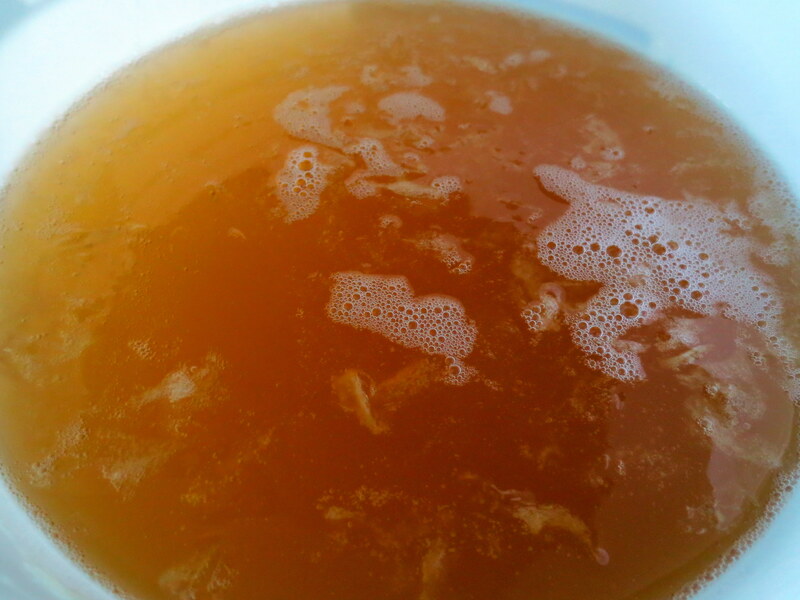 Combine the lye water and oils in the crock pot as soon as the lye is completely mixed (clear solution). No need to wait for lye to cool or oils to reach the target temperature! Stir gently. Pulse with the stick blender until you reach trace. Sunflower oil is really slow to get to trace, so you might be blending for about 15-20 minutes. Put the lid on the pot and let the mixture rest for 20 min. If there is any separation, stir for a bit, and replace the lid. Check on the soap once an hour for the next 5-6 hours, stirring it when you check on it. The soap will go through lots of stages: “thick applesauce”, “custard”, “mashed potatoes”, “taffy”, “chunky vaseline”, and “translucent vaseline”. The worst ones are the “mashed potatoes” and “solid taffy” stage. Even with the potato masher, it is tough to move it around. Once the soap has softened and turned translucent (vaseline stages), check if it has cooked long enough. Combine 2 oz boiling water and 1 oz soap paste. Mix it really good. Then let it cool down. If the cool mixture is clear or lightly cloudy, you are on track. Otherwise, if it is milky, cook for longer or perhaps there was a mis-measurement. I read you should dilute the paste such that the final solution is 30% soap paste. For me, since my soap paste weighed 2 lb, this means that I needed to add 56 oz of boiling water. For whatever reason, this was not enough, and I added about 90 oz of water to the soap paste (in total). I should verify whether this is due to Colorado’s hard water, or not. After adding the water, turn off the heat, replace the lid and go to bed. The soap will take its sweet time to dissolve. Stir it every once in a while. This is a days-long process. It’s important to let the soap cool completely while you dissolve it in water. I find the soap takes longer to dissolve if the heat is on. Separately mix a 33% borax solution: 3 oz borax in 6 oz boiling water. As long as the mixture is hot, the borax will be dissolved in the solution. As it cools, borax precipitates out and you can’t use it in your soap. I found that heating the water on the stove and mixing the borax in the pot was the best way to keep it dissolved. You should use about 0.75 oz of borax solution per pound of soap paste. I used about 3 oz for this batch of soap. 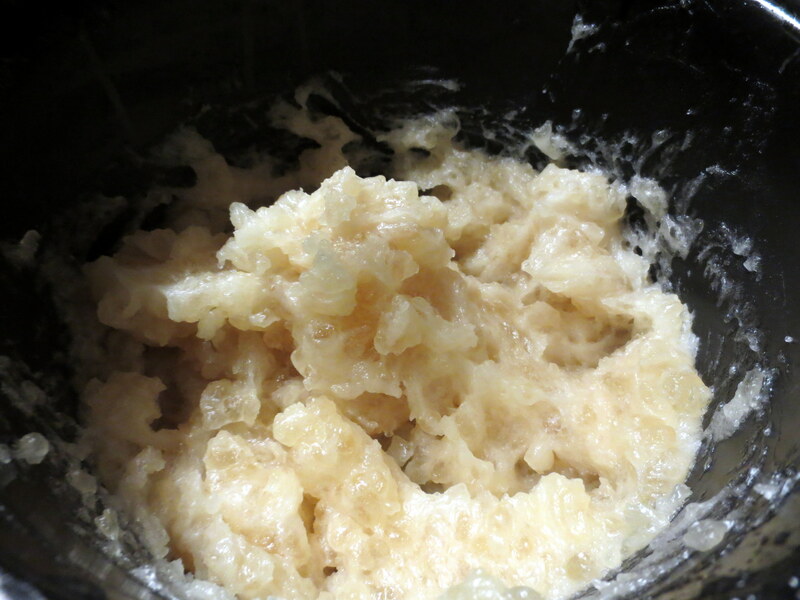 Too much borax will make your soap cloudy, and too little will make your soap somewhat drying. Add the essential oils after you neutralize the solution, but before it cools down. The overall color of the soap is amber, so adding other colorants should account for this. Use about 1 oz of essential oil per pound of paste. I don’t like too much scent in my soaps, so I generally round down. Let the soap cool. Once cooled, pour it into bottles or jars. Set aside in a cool place. Cure (also known as “sequestering”) for 1-2 weeks. Particulates should settle to the bottom of the jar by the end of the week. Discard those when you repour the soap into smaller bottles. I have decided to branch out from cold process bar soaps to liquid soaps (hot process). This kind of soap is a bit more involved (the time commitment is something like 2 days), so it is a natural next step if you’re used to making CP soaps. But the advantage is that the soap is cured in 1 week, and most people prefer liquid soap to bar soap (not me, though!). I think this basic soap will be a good hand soap to place by the bathroom sink. I figured since this is my first try, I should follow a recipe as well as possible. I primarily used candleandsoap (lots of nice pictures here) to make the soap, although I touched on chickensintheroad and ourlifesimplified too. This is an outline of the general procedure. Next time, I’ll experiment a bit more. Something I should have done at the very beginning was measure and weigh all my pots. Diluting the soap paste with water can be tricky (too little water = layer of soap paste, too much water = watery soap), so knowing how much the crock pot weighs and subtracting that amount from the crock pot + soap paste would have made my life a lot easier. Liquid soap recipes are usually formulated with 10% lye excess to ensure complete saponification of the oils. The extra lye is neutralized later with boric acid. Pour the oils in the crock pot and heat them to 160F. The oils should be at about this temperature for the entire process (give or take 20 degrees). Sometimes the soap can get to 180F, and from what I’ve been reading, this is alright. The original recipe told me to dilute the paste with 40 oz of boiling water, but I found this wasn’t enough to completely dilute the paste. Of course, I didn’t know that until after I added 40 oz of water. After adding the water, I turned off the heat on the crock pot, replaced the lid and waited for about 1 hour, stirring occasionally. I thought could head to bed while the soap dissolved overnight (the directions told me to!). And in the morning, it should have been completely diluted, but I got a thick layer of soap paste. Bum. I continued to add boiling water in 10 oz increments until I got complete dilution (stirring and waiting throughout). It ended up taking a few extra days to get the soap to completely dilute. I was pretty conservative in adding extra boiling water, since I didn’t want my soap to be too watery. 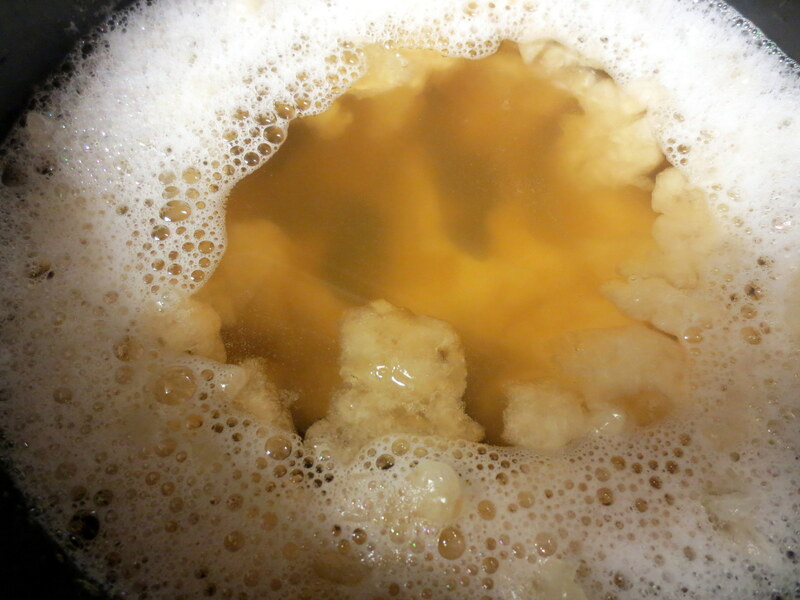 Pour and mix 2 oz of the neutralizer solution (borax has pH of 9.2) in the crock pot in 1 oz increments. If, after mixing the first ounce of borax water in the soap there is no cloudiness, proceed to add the second ounce. You generally want 0.75 oz of borax for 1 pound of soap paste (discounting the added water). This recipe has 2.8 lb of paste, so we use 2 oz (ish) of borax. Too much acid causes cloudiness, so round down. Add the essential oils. The overall color of the soap is amber, so adding other colorants should account for this. Here goes my second batch of swirled soap! 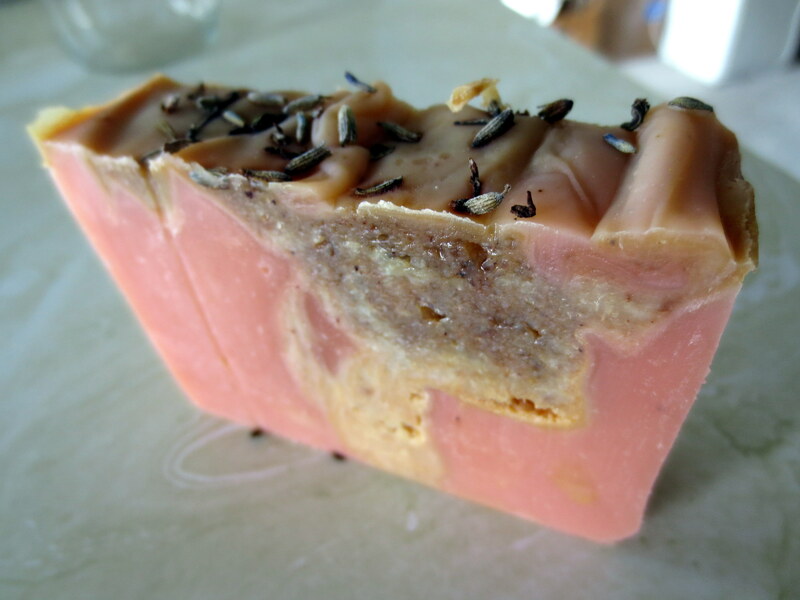 This soap is a blend of olive oil, coconut oil, and sunflower oil. I added some kaolin clay, which prevents acne by reducing sebum secretion, and is generally a good detoxifying and cleansing agent. I got a color sample from my recent order to the soap store, and it turned out to be a pretty pink color. Since this is mostly olive oil, we have to cure for 4-6 months. Unfortunately, when I cut the soap, I got some oil pockets. From what I’ve been reading online, this is likely due to the added fragrance. Since I’ve used cedar EO before without any issues, it must be the ginger EO (this is my first time using ginger). Since the oil pockets are small, the soap is okay. It’s just a little ugly. Bum. 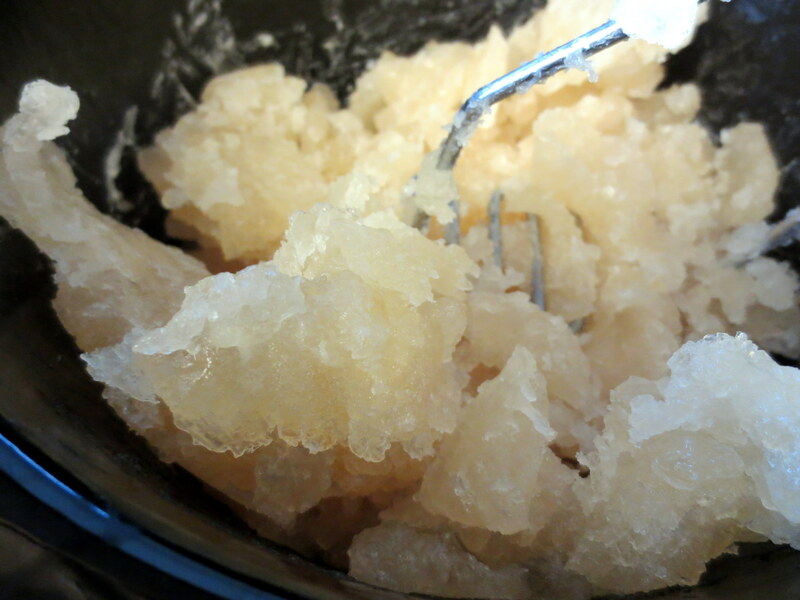 Mix the myrrh gum powder and water in a separate container, which is about 4 cups in volume. Set aside. Carefully pour the lye water into the oil blend. Gently stir with a heat safe rod. Pulse the stick blender in the mixture a few times, and then patiently blend until you are about halfway to trace. Pour some of the saponified oils in the container with myrrh gum powder. Add the ginger EO to the container with the myrrh gum powder and the cedar EO, kaolin clay, and mica shimmer to the other container. For each container, pulse the blender to mix a few times, stopping before you reach trace. Pour the entirety of one of the mixtures in the soap mold. Starting at a low height, pour the entirety of the other mixture in the soap mold.